Tying an open knot with an extra twist when tying the first throw should be one of many surgeon’s basic skills. Such a knot is called a surgeon’s knot. Therefore, the surgeon’s knot is very similar to a square knot, except for the double twist in the first throw (Figs. 7.1 and 7.2). Any type of wound closure and sutures of the fascia and of the subcutaneous tissue are usually fixed with a surgeon’s knot. 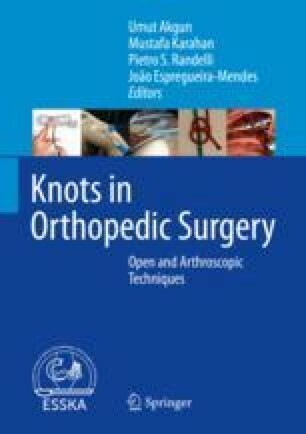 Depending of the knotting technique—either by using hands only or by using a needle holder—there are several subtypes of a surgeon’s knot. One-handed as well as two-handed techniques with numerous technical modifications have been described in the literature [1–7]. However, in many situations a surgeon prefers to use a needle holder when performing a surgeon’s knot. The first throw of the knot again includes an extra twist around a needle holder, before two more throws with one twist each are being added. One of the three throws has to be performed in the opposite direction in order to achieve interlocking of the knot. Again, modifications do exist .